The intraocular pressure in this eye is 42mmHg which explains its redness. But what is causing the glaucoma? The yellowish-white mass in the pupil is a ciliary body adenoma which has gradually enlarged resulting in raised intraocular pressure. Enucleation is the best treatment although these tumour rarely metastasize. 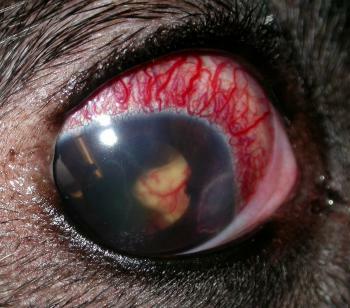 This entry was posted in Cases and tagged ciliary body adenoma, dog, glaucoma. Bookmark the permalink.